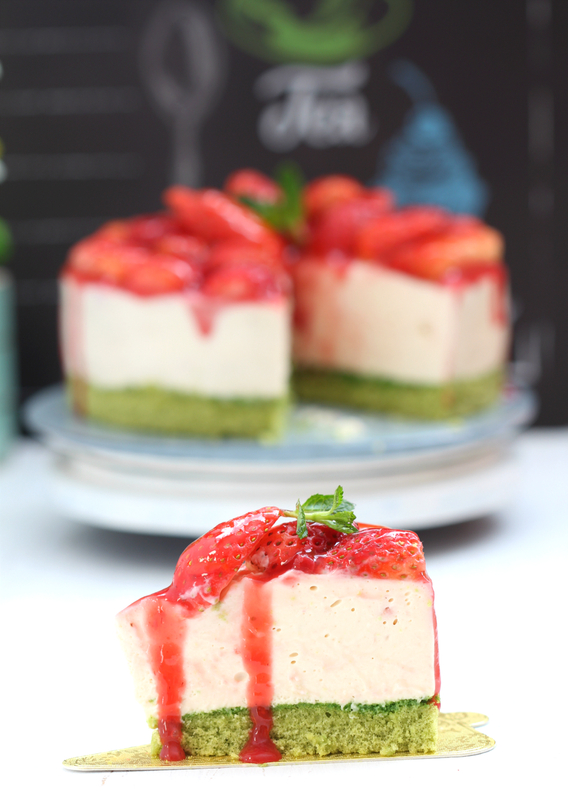 my bare cupboard: No-bake strawberry cheesecake "
How's your New Year's baking resolutions coming along?! I was planning to assemble another Fraisier but it would be easier and faster to do the cream cheese filling than crème diplomat. So, I repurpose the 3 components of that cake and made this delicious and summery treat. Or should I say wintry treat as strawberries here are a winter crop?! This is the first time that I used sponge cake as a base for no-bake cheesecake. 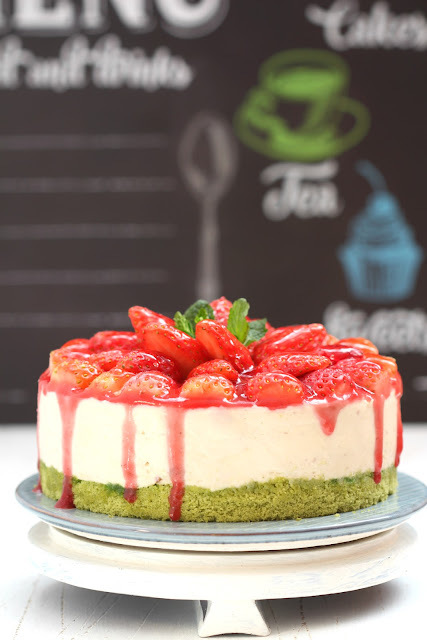 Since matcha/green tea pairs perfectly well with strawberries, using the matcha genoise sponge is a no-brainer. The sweet sponge is a delightful foil to the pillowy and sinful cream cheese filling - the sweet-tarty fresh strawberries and compote add a delicious texture and flavour. No time or inclination to make a genoise sponge? You can use 100 grams biscuit crumbs and 25-30 grams melted butter for your cheesecake base instead. The strawberry compote recipe is a bit time consuming and if you're one of those who can't be bothered to make a homemade purée...... You can always use your favourite strawberry sauce recipe. 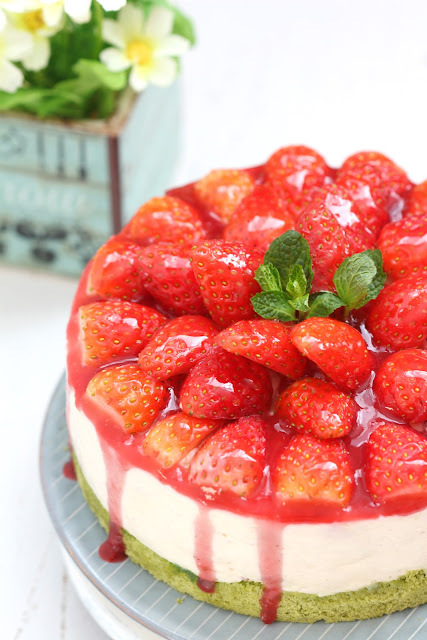 The cream cheese batter is firm enough to decorate the top with berries before chilling, just gently press each slices of strawberry on top so that berries will stick on the batter. * Preheat oven to 170ºC. Line na 18-cm round pan with removable bottom with parchment paper. Sift flour twice. * In a bowl , beat eggs with a whisk, add in sugar and glucose, mix well. Place bowl over a pot of simmering water. Stir mixture until sugar is completely dissolved or temperature has reached 39-40ºC. * Take bowl out from the heat and beat on high speed until light and fluffy. Reduce speed to low and continue beating to even out the texture of the batter, 1 minute. Gently fold in the flour with a spatula . * Combine butter , milk and vanilla in a small bowl and heat until butter is melted. Add about 1/4 of the egg batter to the warm butter mixture and mix well, add it to the batter and fold evenly. Pour batter into prepared pan and bake for about 40 minutes or until toothpick inserted in the middle of the cake comes out clean. * Once cake is done, immediately remove from the pan and put on a wire rack, you can cover it with plastic wrap or place the cake inside a food-grade plastic bag to keep it moist. Let cool completely before using. * Cut matcha sponge cake using a 6-inch mousse ring, trim it into 1/2-inch thick. Place mousse ring on a baking sheet lined with an 8-inch round parchment or wax paper. Put mould on top of the parchment and gently place the trimmed sponge, cover with plastic and set aside until needed. * Combine 25 grams caster sugar and 50 grams drinking water in a small saucepan. Let boil until sugar in completely dissolved, stirring from time to time. Cook over medium heat for about 1 minute to thicken a bit. Transfer to a small heat-proof bowl and let cool for about 5 minutes before sifting in 1 gram of matcha powder. Stir until matcha is dissolve completely, set aside. * Brush some syrup on top of the matcha sponge, set aside. * In a bowl, beat cream until soft peaks form, chill in the fridge until needed. * Soak gelatine sheets in a bowl of cold water for about 10 minutes or until softens. Squeeze off excess water and combine with milk in a small bowl. Place bowl in a pot of barely simmering water, stir until gelatine is completely melted. Keep mixture warm. * In another bowl, combine cream cheese and condensed milk and beat until light and fluffy. Drizzle in the melted gelatine and continue beating until cream cheese batter is smooth. Fold in the whipped cream and stir until well incorporated, stir in strawberry purée. * Immediately pour in the cream cheese batter into the prepared 6x2-inch pan and smooth out the top. 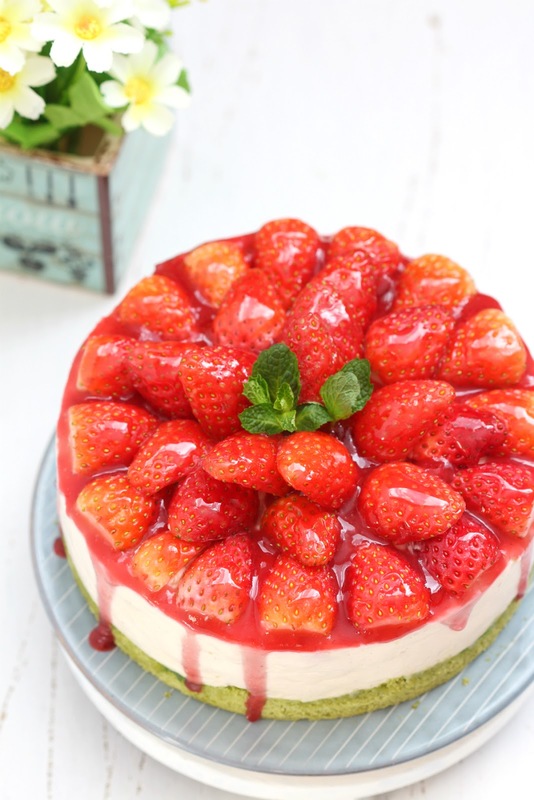 Place cut strawberries on top of the cream cheese filling, gently pressing in berries onto the batter, in a concentric circle, angling the 2nd circle halfway on top of the 1st circle with tip facing outwards. Do the same with the rest of the strawberries until top is completely covered. Chill in the fridge overnight. If the batter is a bit soft when you put in the berries, chill in the fridge first to firm up the batter, about 30 minutes or so. * Ran the hairdryer/blowdryer around the sides of the mould for few minutes. Gently shake the mould until cheesecake pops down. * Use a metal spatula dipped in hot water ( wipe it dry first) to smooth out the sides of the cheesecake. Chill for about 30 minutes before adding in the compote. * Gently spoon in the compote (use only the sauce, not the strawberry bits) along the sides of the strawberry slices and around the edges. * Cut and serve. You can drizzle some remaining compote in each slice. * Place strawberries in a food processor and blitz until smooth. * Put water and sugar in a small saucepan and bring to the boil. Remove from heat and and leave to cool slightly. * Pour warn syrup and lemon juice to the puréed strawberries and mix well. Strain through a fine sieve into a bowl, let cool and chill in the fridge until needed. * Mix together the sugar and pectin in a small bowl. * In a small saucepan, combine the purée and sliced strawberries and bring to a boil. Add the sugar -pectin mixture and cook for 2-3 minutes over medium heat. Pour in a heat-proof container and let cool then chill in the fridge until needed. * Combine 25 grams caster sugar and 50 grams drinking water and bring to a boil, stirring to dissolved the sugar. Cook over medium heat for 1 minute to thicken a bit. Transfer to a small heat-proof bowl or glass and stir in 1 tsp strawberry jam. Mix well to combine, let cool completely before using. Such a beautiful spring cake! Happy New Year to you too, Anne. Agh, Such a beauty! Happy New Year, Anne!